If you’d like to know what you can expect from your upcoming dental implant procedure, you’ve come to the right place. We’ve put together a handy step-by-step list to help you understand just how we’ll carefully place your new implants to help you enjoy a sturdy, beautiful smile! Whether you are getting one implant or a full arch, it will help to familiarize yourself with the procedure so you know what to expect. Unlike most dental offices, we have a periodontist (implant placement) and a prosthodontist (implant restoration) on staff so both stages of the implant process can be done right here at our Boston dental office. During your initial consultation, your dentist will perform a detailed examination of your mouth and take x-rays to gather vital information and ensure you are a viable candidate for dental implants. Once you have been cleared for the procedure, your dentist will then begin planning to place the implants. Before the implantation occurs, we need to create room for the device in your jaw bone. This process is also called site preparation. Using a drill, we gradually increase the size of the osteotomy until it is just right for the implant. During this step you will likely feel vibration in the mouth, but it’s rarely more than a slight sensation. 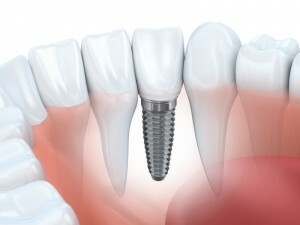 Once we have made room for the implant in your jawbone, the tiny titanium device can be placed. After it is securely in the bone, the gum tissue is sutured around the implants and healing begins. A temporary tooth replacement may be placed for you to wear during your recovery. Even though the procedure for implantation is complete, you are not finished with your implant process. In fact, the weeks after implantation are perhaps the most important for the success of your dental implants. That’s because this period is when osseointegration occurs, or when the bone and the implant fuse together to form one solid unit. This is what gives your implant the stability to support and retain your new teeth increasing your quality of life. When the recovery period of approximately six to twelve weeks is complete, your dental implants are fully secure in the mouth and ready to receive the new tooth replacement on top. Before you will get your new teeth our experienced team will take an impression of your now healed and stable implants. A laboratory technician then fabricates your new teeth by hand in a dental laboratory. This usually takes a few weeks. This step is where the fun begins — you come back to Kraft & Schrott Dental Associates, where you will receive your new teeth. Once your dental implant procedure is complete, you are able to enjoy your new teeth and all the benefits of a complete smile once again. When cared for properly, dental implants can last a lifetime. Do you have remaining questions about your upcoming dental implant procedure? If so, please do not wait to contact our courteous and helpful team at Kraft & Schrott Dental Associates. We are here to provide everything you need related to your oral health — so contact us to schedule your appointment today!